Dino Dig wooden puzzle by Ryan's Room gives preschoolers multidimensional view of kids favorite prehistoric creatures - dinosaurs! 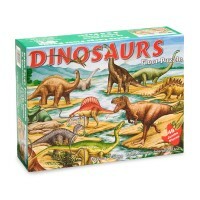 Take a trip back in time to the era of the dinosaurs! 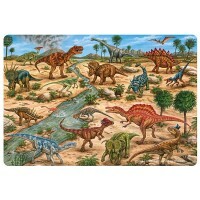 See your favorite dinosaurs, their skeletons, and their names - all on one wooden puzzle! 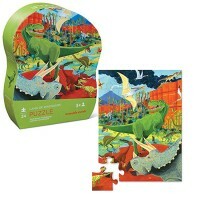 The Dino Dig See Skeleton Inside Wooden Puzzle from Ryan's Room wooden puzzle collection, is a unique puzzle for dino lovers of all ages. 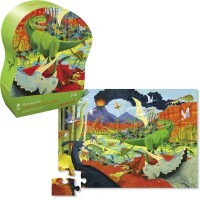 What's special about this dino puzzle? 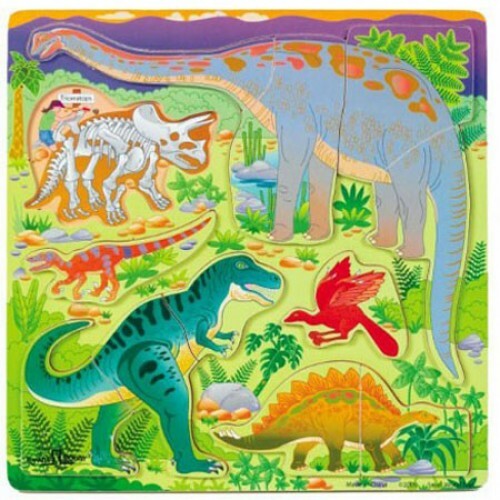 It has multidimensional view of kids favorite prehistoric creatures. 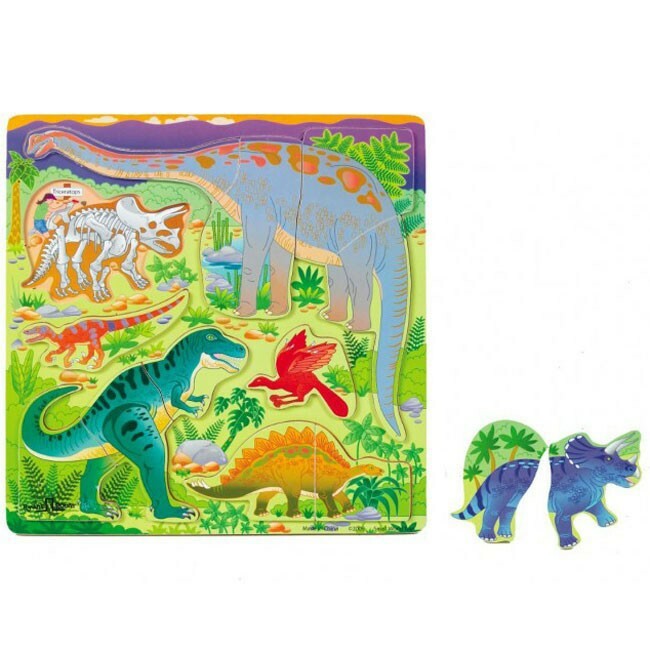 This dino theme puzzle features a wooden board and 13 sturdy pieces to create 5 kids favorite dinosaurs: T-Rex, triceratops, pteranodon, brachiosaurus, and stegosaurus. 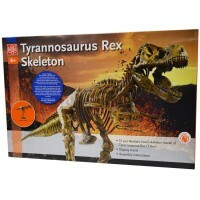 Remove the raised dino parts pieces to see the dino skeletons underneath. The revealed dino pictures also show the name of each animal. 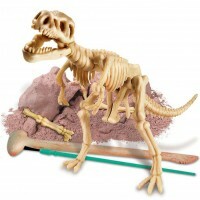 Dino Dig See Skeleton Inside Wooden Puzzle, offered by Educational Toys Planet, will introduce dinosaur science to preschool kids and bring puzzle fun time. 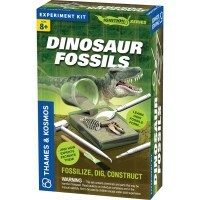 Dimensions of package 8.5" x 15" x 8"
Write your own review of Dino Dig See Skeleton Inside Wooden Puzzle. Rating: 1 I bought this for my daughter because all of the baby puzzles with pictures under the pieces were too easy for her by By A customer This picture is misleading. I bought this for my daughter because all of the baby puzzles with pictures under the pieces were too easy for her. The item shown here appears to have blank space under the pieces. In actuality, there are pictures underneath, making this way to easy and not at all what we wanted. I don't know why the seller would even try to change the real appearance. Rating: 3 Just ok. by By A customer I wanted to write a review since the product description is a little misleading. There are no knobs on this as described, and the animal names are not written on here anywhere. 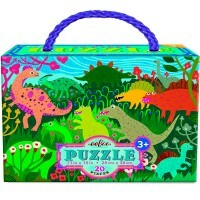 I'll stick to the less expensive Melissa & Doug chunky puzzles from now on. This is a nice puzzle, but for the price, I expected more. 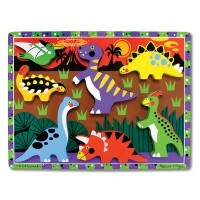 Rating: 5 Great puzzle for learning fun by By A customer Awesome toy for the bug loving toddler. It's nice that it's not color matched paint on the indents of the puzzle. Great for my boy! Rating: 5 Interesting puzzle by By A customer My 2 years old loves this puzzle. 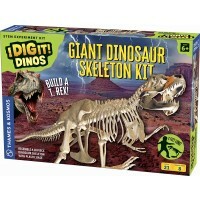 It has big pieces easy to grab and it shows the skeleton inside the dinosaur. Nicely pictured, exactly as pictured. I would recommend for toddlers. Rating: 3 Suitable for YOUNG children only by By A customer We bought this puzzle for my daughter around the time she turned 18 months. She loves peg puzzles and we thought this would be a good addition to her collection. The puzzle itself is good quality, the wood was smooth and the animals were brightly-colored.But, it is just too easy for my daughter! She got bored quickly with this puzzle and now always passes it up in favor of her other puzzles.The manufacturer's suggested age for this puzzle was 36 months, but there is no way a three-year old would find this puzzle entertaining! I think it would be a good puzzle for babies around 12 months of age. Rating: 3 Not as good as the Melissa and Doug puzzles by By A customer I thought I would try one of these while ordering some other puzzles for my daughter. It is ok but I wouldn't purchase any others. The pieces aren't finished or painted on all sides so they feel pretty rough. The board isn't painted under the pieces making it more difficult for my daughter to match up pieces. It is just as expensive as the Melissa and Doug puzzles and they are much nicer. Rating: 5 by Patricia, NY Looks good. I can't say how I feel about them yet. We're saving them for when our preschool storytime starts up again in September.